Dealing with a disorganized kitchen can be frustrating. The good news is that you can take care of all the pots and pans in a systematic manner by creating a separate space for them. Let’s look at some simple and innovative ways to organize the pots and pans in your kitchen. You can give the bare and blank wall a stylish and functional upgrade with a pegboard. Adding a pegboard to the kitchen instantly adds a lot of space and you no longer have to try and accommodate everything inside cabinets. Make use of hooks to hang the pots and pans. Keep a little bit of space between the pegboard and wall, so that you are able to hang the hooks properly. This ensures that the hooks fit properly on the board. The top priority in any kitchen is functionality. Even though you may not have a large wall to organize and hang all the pots and pans, you can make use of smaller spaces to hold the kitchenware. Short pipes with “S” hooks are an ideal choice to keep different kitchen items in a systematic manner. You can hook and unhook the kitchenware whenever you want. If you don’t want the side of the cabinet to go to waste, you can install a towel bar to turn that space into storage. As the bar will not be able to accommodate all the pots and pans, you can choose to keep those that are frequently used. If you are out of the cabinet and drawer space, you need to start thinking vertically. 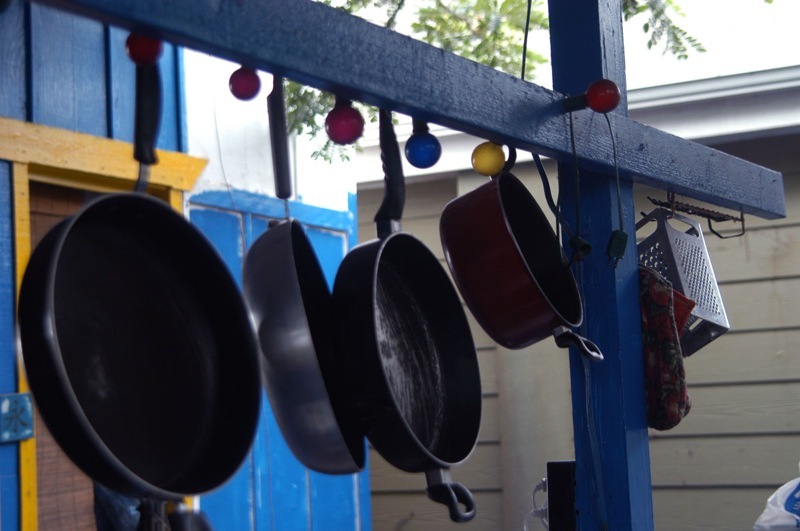 Use hooks to hang the pots and pans in a window. This ensures that you don’t take away valuable wall space for storing kitchen utensils. When you hang different items aesthetically in a window, it can provide an elegant look to the kitchen. The magnetic knife strips can be used in an innovative manner to store pot lids. If the lids are magnetic you can choose to store them this way. The wire rack holder in the cabinet can give pots, pans, and lids a designated place. The pots can be stored up front whereas the pans can go in the back. The lids can go on top. This enables you to remove and place them in the cabinet without much of an effort. The wall next to the stove can be used to store things. You can make use of two or more rails and an “S” hook to organize all pots and pans systematically. The oversized shelves are a stylish addition to a small kitchen and can be used to store multiple things easily. When it comes to storage space in a small kitchen you can always use hooks, cabinets, drawers, railings and many other things to find a solution that works best for you.